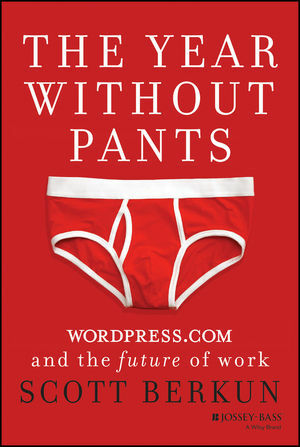 This week I have been reading The Year Without Pants by Scott Berkun. This is one of those rare beasts – a book about management and leadership that had me engrossed in every word. The book is Berkun’s account of working for Automattic, the company that built and runs WordPress. It’s really about how someone with a traditional management background at Microsoft coped with leading a team of techies at a company with no email, an open vacation policy, no offices and few conventional rules. It is a fascinating insight to a futuristic work culture that many of us would love to experience. There are no formal interviews for jobs in the company and they are not interested in CV’s. Automattic hire via a trial process doing real work with real tools. If you do well, you get hired. Simple. Induction? Like all new Automatticians, Berkun spent his first few weeks not doing anything related to the role he had been hired to fill but working as a “Happiness Engineer” in the front-line customer support function fixing issues with people’s blogs. He was expected to pull his weight and his performance was tracked and measured. This gave him a complete understanding of the company product and how it works. The company culture is a results first culture. All that matters is your output. It doesn’t matter where, when or how long you work. You can be sitting at home with no pants on for all they care, all the emphasis is on being productive without the traditional workplace distractions. Team meetings happen in chat rooms and via Skype. In the way WordPress is all about democratising publishing, so it seems to me the company’s culture is also about democratising the workplace and removing the distractions and management/support layers that are considered crucial in most organisations. Take email for example. Berkun estimates email communication amounts to about 1% of communication at Automattic. The rest of us have become slaves to email, constantly checking our mobile devices even out of hours to devour and respond to any email communication, particularly those of us who work in globally distributed companies. Have you ever imagined life without email? If you are older, can you remember life before email? Technology these days has made it possible to survive without email so why aren’t more of us trying that? There are so many other ways of communicating one to one with distant and not so distant colleagues. I would go so far as to suggest if every company got rid of email, we would all be far more productive and collaborative at a stroke. Is this one of the changes we will see in the workplace over the next few years I wonder? In his final chapter, Berkun focuses on the meaning of work and this also had me thinking. Many people do not associate meaning with work, and see it only as something serious they have to do to get paid. He makes the point that often the people who are paid the most are the most confused, because deep down they know their work has little meaning to themselves or others. There is always an assumption that the big promotion, or that dream job with high wages, will make us blissfully happy when often it doesn’t. What ultimately makes us happy and provides meaning is working in a company with strong values, a long term vision and doing work that matters to us individually while making a difference to someone else. You might argue a lot of workplaces are already like that. But we do the work on their terms not ours. For another interesting perspective on work meaning, check out last week’s post by Perry Timms. As more and more discussions spring up about the future of our HR profession, surely we need to be discussing the future workplaces we want to see alongside that? We can’t map out a future for HR unless we understand the cultures, work practices and types of workers that will become the mainstream in future years. Will link back to your post soon, in transit just now. Thanks Doug. I did see your post the other day. This is a book I had seen around a few times but heard Bill Boorman recommend it last week and it sounded like something I had to read. Glad I did. I meant to add – thanks for the pointer to Perry’s post, I’d missed it when it first came out. I enjoy reading people’s stuff particularly when it links to others. This book sounds v interesting, thanks for the great review. I personally think email will be around for a long while to come, despite technological advances – however, I already see people changing their approach to email comms; less assumption that email is read/actioned not long after you hit ‘send’ and more analysis about the best way to get hold of someone or to share your message. Folk also seem more open to alternative communication methods, such as instant messaging, video conferencing, using Lync or Skype, and using SharePoint intranets to share info that would’ve traditionally ‘littered’ every user’s inbox. There is hope! Thanks Sara. You make a good point. I think you are right Susan. I am seeing a lot of people using email differently and exploring different ways to communicate. Seems to be more multi-channel these days. I still get email spam though from companies that should know better! I love the common sense approach to the paragraph to shared from the book. Better to change to lift performance and morale than being working in a living museum. Excellent synopsis on, “The Year With No Pants.” Your points were well thought out. I know less email would work well for me! I agree with hrmannz that I get spam from companies that should no better! I also reaffirm the idea of “removing restrictions and improving morale.” You held my attention on what the future will bring and hopefully it’s less email and innovative to us with less clicks!